Everyone who knows me knows I’m a bit of a shopaholic. The thrill of finding the cutest skirt at a great price or discovering the perfect set of earrings that finish off a flawless ensemble is truly exhilarating. And who doesn’t want to look fabulous when they’re out shopping or simply running errands? For the holidays, I decided to make these customized shopping totes for the other shopaholics in my life. They’re surprisingly easy to make and come out beautiful. The best part is that you can tailor each one to the person you’re making them for, giving them a unique, one-of-a-kind present that they can use every day. The key here is to think of a design that fits the personality of the person who will be receiving the tote bag. What’s the first thing you think about when you think of them? What’s their favorite hobby, sport, or food? Once you figure this out, the rest is easy. For my abuela (grandmother), I decided to go with a garden-type design because she loves flowers. The fabric paints are easy to work with so that took no time at all. My mom had some leftover vine leaf ribbon from my son Evan’s baby shower (it was a jungle/monkey theme) and my sister and I scrounged up our leftover single earrings and mismatched jewelery pieces we had and found some nice flowers to hot glue to the bag design. 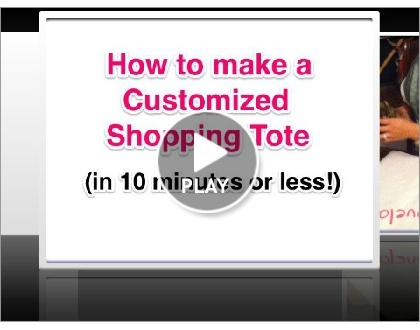 Use your creativity, take a look through some craft books, or check out Pinterest.com for some inspiration to make your own customized shopping totes.